I don't want to make it a point to kick a man while he's down, or to appear to be gloating, because that's not what I'm going to do here. I understand that tOSU has had Michigan's number for the better part of the last 10 years. This post is not inspired nor in-response to that. This is just a commentary about what is happening in Columbus, and what I think about it. I have to hand it to Jim Tressel, or as I like to refer to him as...Sir Teflon. Why the nickname? Because, at least until now, none of the absolutely absurd things that have happened while he's been the head coach at tOSU have ever stuck to him. Tressel has made a very good living by looking the other way when his players have repeatedly broken the rules, and surrounded themselves with people that should not come within 500 feet of a student-athlete at a Big Ten school. Until now, he's never been found guilty of doing anything wrong. He managed to stay clean through the whole Maurice Clarett mess in 2001-2002. He managed to stay clean through the Troy Smith booster scandal in 2004. He's managed to stay clean in spite of the over 375 minor violations reported by the school between 2000 and 2009...more than any other FBS school...by far. And until two days ago, he attempted to stay clean through this latest round of scandal by lying to the NCAA, his boss, tOSU, and the entire Buckeye nation so as to not get his "senator" image tarnished. Sir Teflon should teach a class at tOSU about alluding blame and claiming no responsibility. He's made a great living at doing just that. Do I sound like a disgruntled Michigan fan? Probably. But I've been saying for years about how dirty this coach is. And just when it seemed like Sir Teflon was about to pull a rabbit out of a hat again, Charles Robinson and Dan Wetzel of Yahoo! Sports were able to do something that countless NCAA investigations and investigative reports have not been able to do in 10 years...they caught Jim Tressel in a lie. tOSU's response? A quickly thrown together press conference in order to allow Tressel to attempt to talk circles about how concerned he was about his players safety, allow the AD and the university president to talk about how much they stand behind their coach. Hell, President Gee joked that he hoped Jim Tressel would not dismiss him(!). It was said as a joke, but it clearly shows you who is really in charge in Columbus. 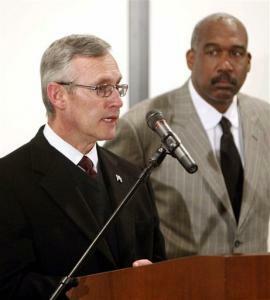 After last night's press conference, it is obvious to me that there is no one at tOSU that can fire Jim Tressel. Even when he blatantly avoided telling his boss about what he knew back in April, tOSU AD Gene Smith was STILL adamant about his devotion to his football coach. Obviously, in Columbus, the tail wags the dog. It will be interesting to see how harshly the NCAA will judge Sir Teflon and tOSU. This is their opportunity to really make an example after really flubbing the whole Cam Newton case. My opinion? I think Tressel should sit out just as many games as his players...5 games. Missing 2 games against MAC schools is not enough. I think he should be reprimanded a little harder. Maybe a larger fine or docked more pay...maybe take away his bonuses. But the self-imposed sanctions are about as harsh as you would expect self-imposed sanctions to be. As far as tOSU is concerned, they should be forced to vacate all wins from 2010 including their bowl win. I mean they played all those games with players that should have been deemed ineligible. It's only fair. This whole situation is huge blow for Jim Tressel, who prides himself on his image and reputation. It's an even larger blow to the University, who will probably be forced to give up more than Tressel will. And ultimately, it's a black-eye to the conference as a whole. tOSU has been the flagship program for the B1G for the last 5 years, at least. Does this signify a changing of the guard? I think so. I hope so. Jim Tressel and the entire football program at tOSU have just begun to be exposed for what they really are. They are a win-at-all-costs kind of program. They are willing to look the other way when their players break the rules or do something wrong. They're willing to lie about it. They've been doing this for the better part of the entire time Teflon has been the head coach. He did it at Youngstown State, and he's done it at tOSU. He's dirty. He doesn't care about his players they way he says he does. He's a scumbag and a liar. Is that the kind of program you want to represent your conference? In my opinion Ohio State should forfeit all 2010 games! I believe Tressel should be fired and Pryor should be off of this team! It is clear that Tressel was covering this up so those players could play. There is no other explanation especially after this Ted Sarniak, the great mentor, email came out. Obviously Tres was not scared of passing this federal investigation info on to this prominent glass businessman. Give me a break about this mentoring "BS"! This "mentor" allegedly crashed his car into the utility pole, drunk, refused to take a breathalyzer and was belligerent to police officers. However he gave gifts and donations to the local police and somehow got out of these serious violations. This is a mentor? In addition, Pryor had a new Corvette and worked at Sarniak's factory the summer before he was recruited by OSU. Sarniak also has a business in Dublin, Ohio, that's doing quite well. OSU coaches and Sarniak had dinner before Pryor's recruiting trip to Michigan. That was swept under the rug. It also bothers me that these football players are hanging out and befriending this tattoo shop owner. I won't mention his name, but you can find it. When you do look at his extensive criminal record, ...http://fcdcfcjs.co.franklin.oh.us/CaseInformationOnline/caseSearch?8a4aAdWWSdRgeIbsTLf7 & http://www.fcmcclerk.com/... Makes you wonder why these kids were hanging with him? If this really gets investigated we will probably find out that Pryor never should have been eligible to play before he even stepped foot into Ohio State.